Spring is always a time when I start making changes. Its like the changing of the season makes me restless and looking for something different. Which may also be why I felt this was the right time to start a podcast. Anyway, Last week I walked in my house and tripped over a pile of shoes. This was not the first time this has happened. Its actually fairly common. But this particular day I had enough. So I sat down and wrote out a list of things that annoy me about my entry way/kitchen. It was a pretty long list. I needed a pantry, place to store lunch boxes, puppy pee pads, and shoes. I also hated that I didn't have any drawer space and the storage container I keep the pet food in needed a better location. I told you it was a big list. So I researched storage cabinets that could be a pantry and a place to store shoes. This side holds large kitchen items that I didn't have homes for. 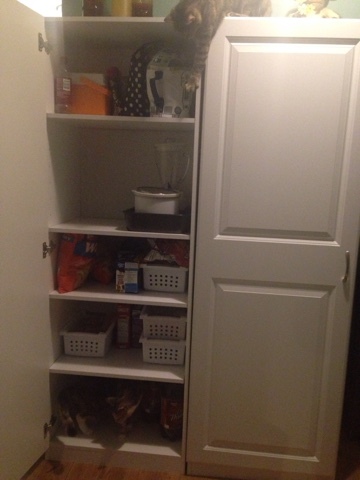 It also acts as a pantry for lunch boxes and lunch supplies. 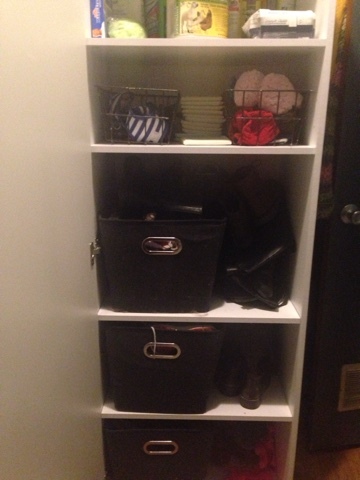 This side holds shoes, hats and scarves, puppy pads, leashes and harnesses. That still didn't fix the problem of having no drawer space. This last weekend I ran into the Habitat Resale Store. People donate items and all profits go to help build houses for Habitat for Humanity. 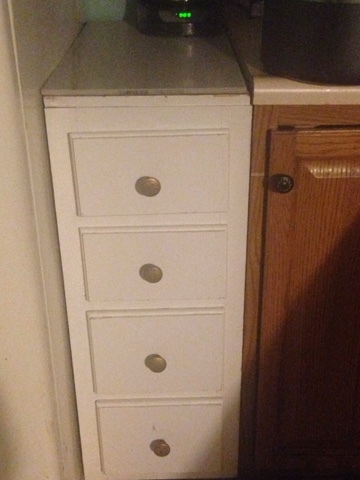 While there I found a small 12X24 kitchen cabinet that is only drawers. I was able to move the refrigerator and slide the cabinet in place. I found a tile at lowes that perfectly fit the cabinet. Now all I have to do it paint all the cabinets so it looks more cohesive. I really hate white so I am leaning toward black or grey.